The Greenbelt Garden Club is a group of gardeners who tend plots in Greenbelt’s three community gardens. These gardens are located throughout historic Greenbelt, Maryland, with plots of varying number and size. Gardenway (pictured) is accessed via the path leading from the end of Gardenway to the Spellman Overpass. This site features 20 plots that range from approximately 30 x 30 feet to 50 x 50 feet. Additional plots are located at Henry’s Hollow (26 plots) and Hamilton Garden (23 plots). Gardeners may obtain membership in the club for a fee of $20 per season. Members are then assigned a plot in one of the three community gardens on a first come, first serve basis. 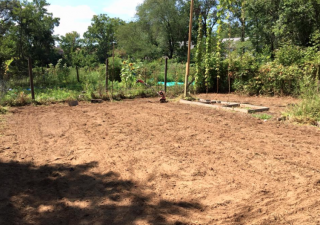 In addition to tending community gardens, the club organizes clean up days and other sustainability-related events, hosts informational meetings, staffs a table at Greenbelt’s Labor Day Festival, and maintains an active online discussion forum to address concerns identified by members.